Going to take a cautious approach with this market today. Raise stops where I can, and even consider a short position if the market warrants it. VIX – Dropped 6% yesterday, with much of its gains coming in the last two hours of trading. Likely to spike on any military action in Syria. T2108 (% of stocks trading below their 40-day moving average): A big 24% pop yesterday, but not quite back at the levels we saw last week of +50%. Currently at 47%. Moving averages (SPX): Tested the 20-day moving average but couldn’t break through. Struggle remains with this MA and the inability to trade above it over the past month. Back above the 5-day and 10-day MA’s. Big, big, breakout in Energy yesterday. Poised to retest its yearly highs again. Double bottom in Materials worth watching as is the case in Healthcare, Industrials, Discretionary, and Financials. Technology trying to hold on to higher lows. 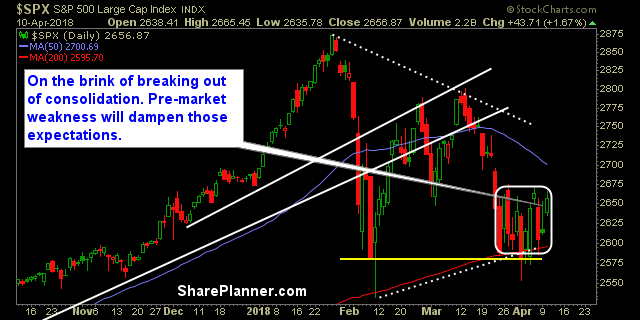 Strong rally yesterday, yet another potential reversal in the making. Price stuck in the range shown in the chart below. A big move in either direction will be required to change that.